the belt, and the links are designed to fall free of each cartridge as it is chambered. Initially devised in Germany, this was quickly introduced into British service in 1916 (the Air Service Mk I) and was rapidly adopted elsewhere. Not all steel belts have been of the disintegrating type, and some (e.g. 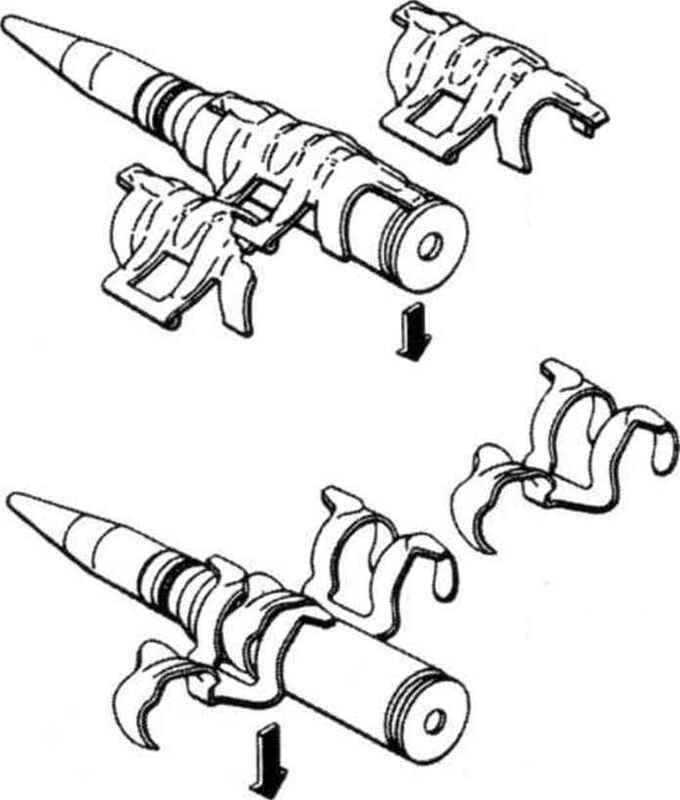 for the German MG 131 and 151) were designed to be convertible between disintegrating and non-disintegrating depending on the installation requirements. Disintegrating-link belts can be extended by clipping on additional sections, whereas non-disintegrating ones generally cannot. Lug on Operating Rod Actuates Sprocket Rotating Cam. both gun elevation and turret traverse. 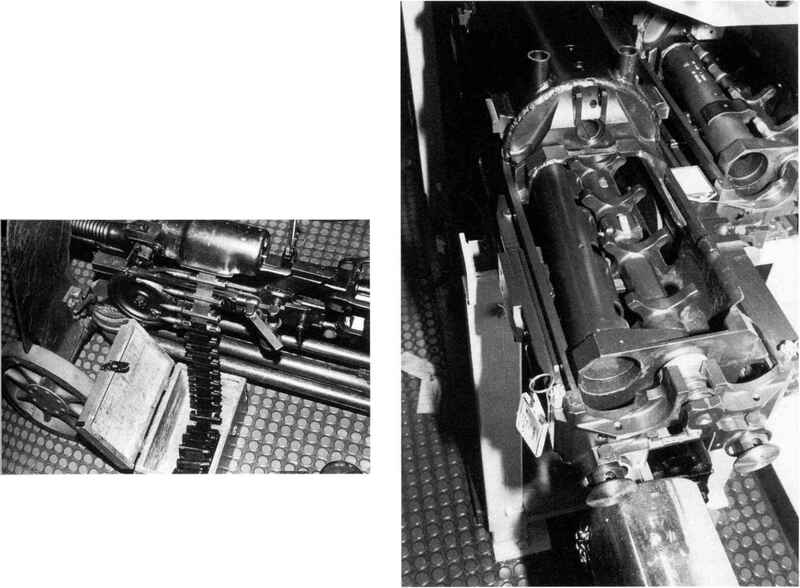 It is common for belt-feed systems to incorporate belt guides to ensure that the belts are fed smoothly into the gun. unsuccessfully) in the Ikaria MG-FF, utilised the force of the gas escaping from the muzzle. The advantage of belt feeding is that large quantities of ammunition can be held ready to fire, limited only by the space available to store it. 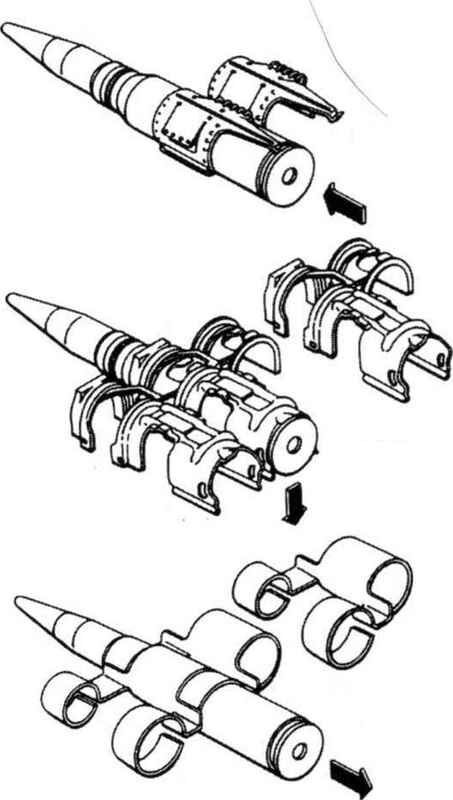 In ground guns, it is also unnecessary to pause while reloading, as in most cases the belt links are designed to allow a new length of belt to be clipped onto the end of the old one. These merits have made belt feeding by far the most common method used by the kind of heavy weapons described in this book; but there are also disadvantages which have led to the use of alternatives in certain circumstances. 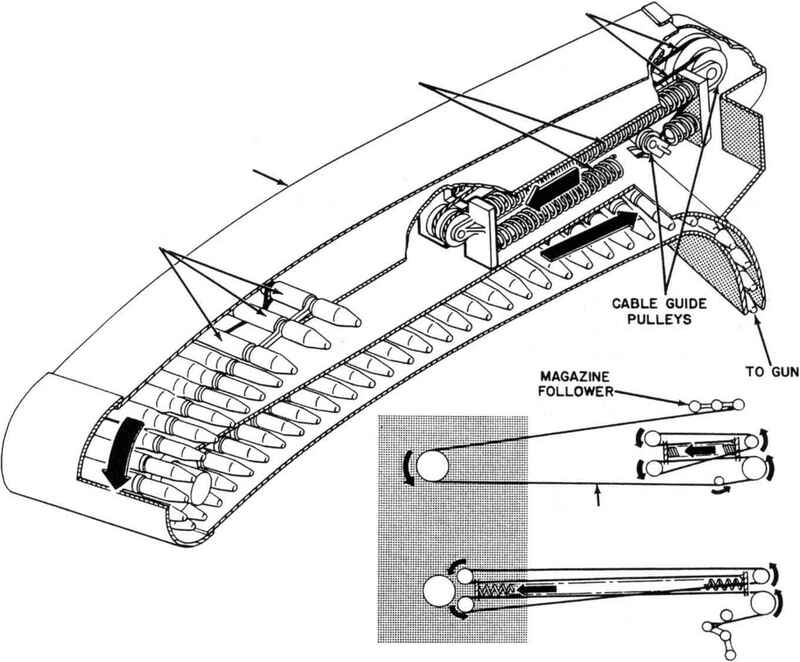 Spring-Loaded Cable Makes U-Shaped Magazine Possible. These difficulties have led to the development of linkless feeds for use with heavy automatic cannon or where very high rates of fire are required. These are often power-driven, the best examples being those for the rotary cannon used by most American aircraft. 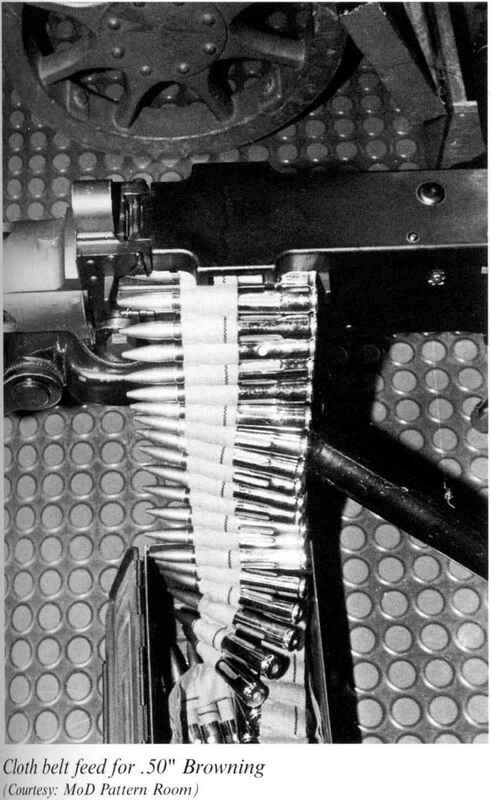 In most installations, the ammunition is arranged in a large helical drum, with the cartridges pointing inwards. 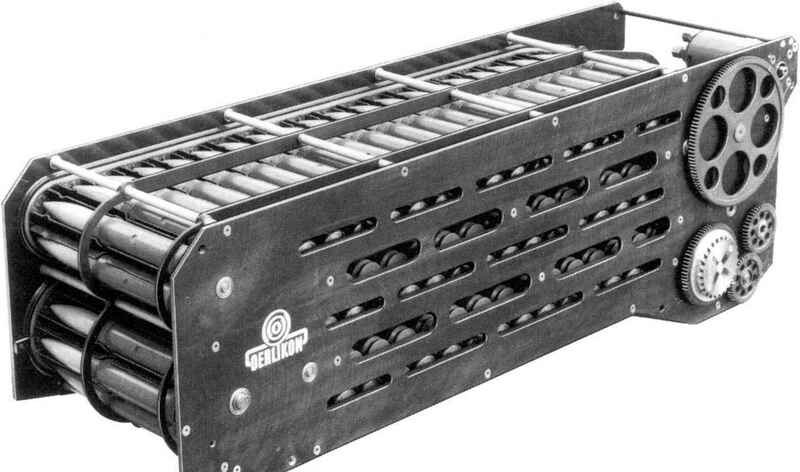 The ammunition feed is driven by the same motor which powers the gun, ensuring that the cartridges are fed into the weapon at the appropriate rate. 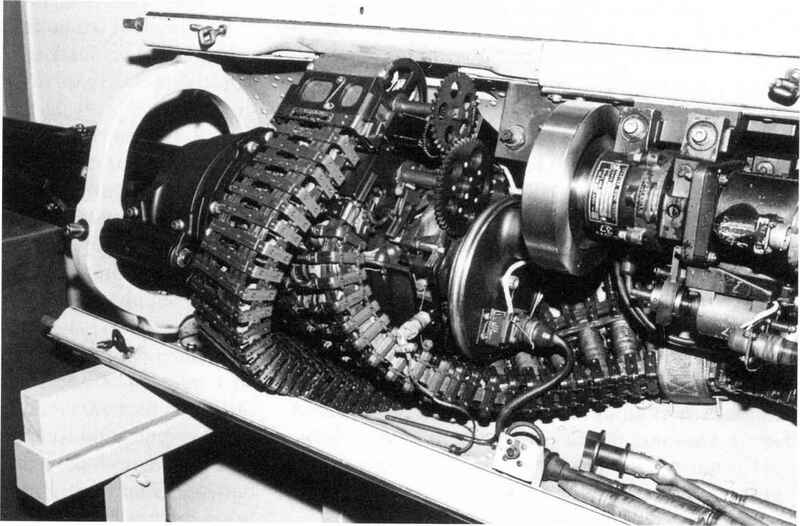 Because of the difficulty of disposing of empty cartridge cases from a supersonic aircraft, the ammunition feed slots the fired cases tidily back into the drum. 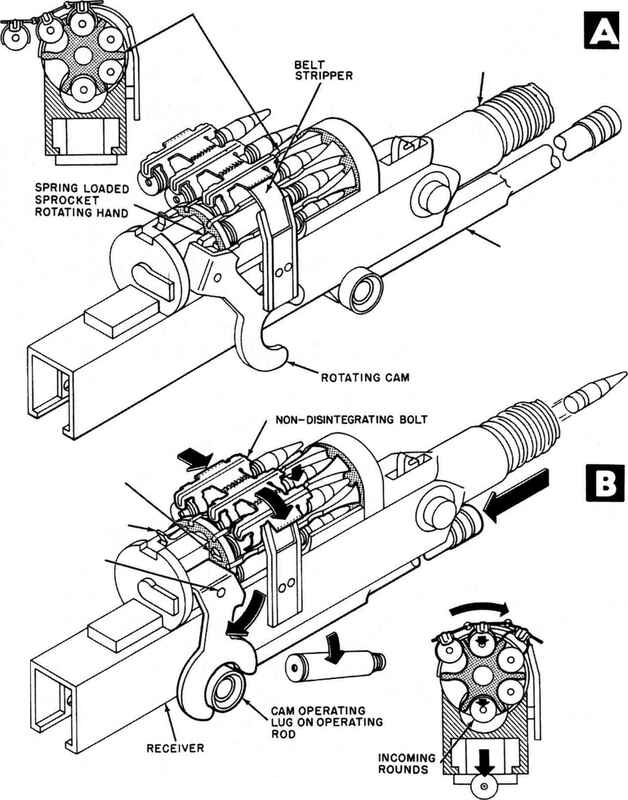 Magazine capacities for the fast-firing rotaries are necessarily high (exceeding 2,000 rounds in one M61 installation) which poses obvious problems in reloading. 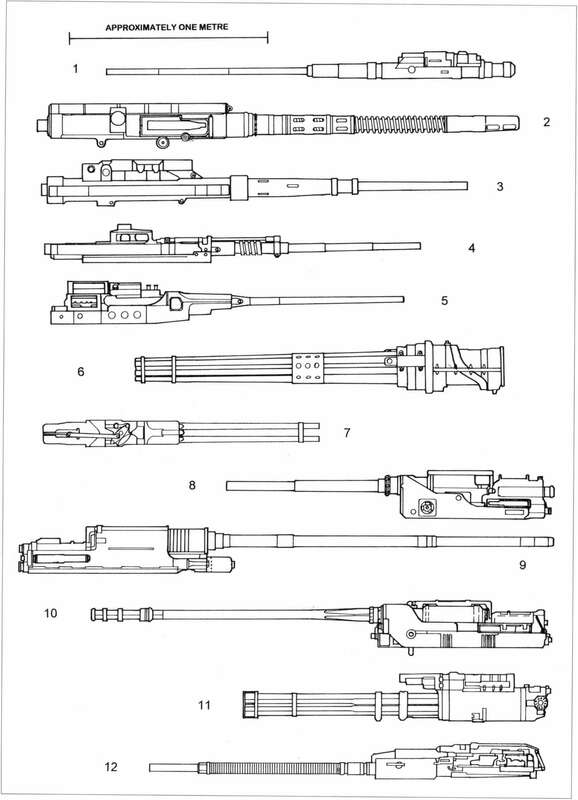 These have been tackled by the universal ammunition loading system (UALS) which is a mobile unit specifically designed to reload M61 guns (and remove the fired cases). It contains its own pneumatic drive and can reload a 515-round magazine in four minutes. An alternative approach to reloading has been adopted for the 30mm M230 chain gun in the AH-64D Apache Longbow helicopter. The 'Sideloader' unit is a mechanical system built into the aircraft which enables one man to load 1,075 rounds, in eleven-round strips, in less than fifteen minutes. This contrasts with the AH-64A, which is reloaded by three men, using ground support equipment, in more than half an hour. Ammunition feeding is complicated by the fact that the majority of heavy automatic weapons are designed to recoil in their mountings in order to spread out the recoil force and minimise vibration. A clip, or a box or small-drum magazine, can recoil with the gun, but it is not feasible to arrange this for belt-drives or other large ammunition capacity systems. It is therefore necessary for designers to find some way of transferring ammunition from a stationary supply to a moving gun. How aircraft machine guns works? How belt fed machine guns work? How do belt feed guns work? How remove the bolt from dshk? How to support a revolving motion of a heavy machine?